One of things that make yoga stand apart from the usual exercise routines is that you don’t really need a special studio or equipment to practise it. Many even go on to claim that the ancient discipline is in a sense a lifestyle. Perhaps that’s why a yoga fanatic didn’t think twice before trying out a few poses in mid air. 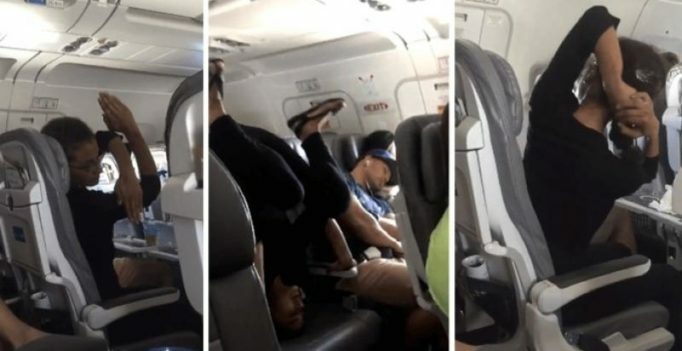 The zealous woman ended up doing an interesting yoga workout, headstands included, during her flight from Los Angeles to Cabo San Lucas in Mexico even as a fellow passenger captured her antics on camera. What’s even more interesting is that she managed to perform her yoga session without even waking up her seat mate. The guy even went on to name her poses and document the reactions of her fellow passengers.